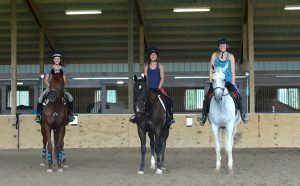 Our horseback riding program is designed to develop independent equestrians. We encourage all of our riders to learn the complete care of the horse. We feel that understanding the horse on the ground enhances the relationship between horse and rider. All of our students are encouraged to set annual goals for themselves whether it be to be able to enjoy a trial ride or to compete at a USEA (United States Eventing Association) championship show. Through goal setting and good horsemanship we develop incredible bonds with all of our horses. We encourage all ages and riding levels to come and experience what a horse can teach you! Horseback riding lessons are given on your own horse or one of our many lesson horses. Contact us today to learn more! Team Ariatti students ready for their lesson.